Become enlightened in Maori history and modern culture through Swain Destination’s expansive Kiwi Culture tour. Drive yourself around the North and South islands to experience New Zealand first hand. 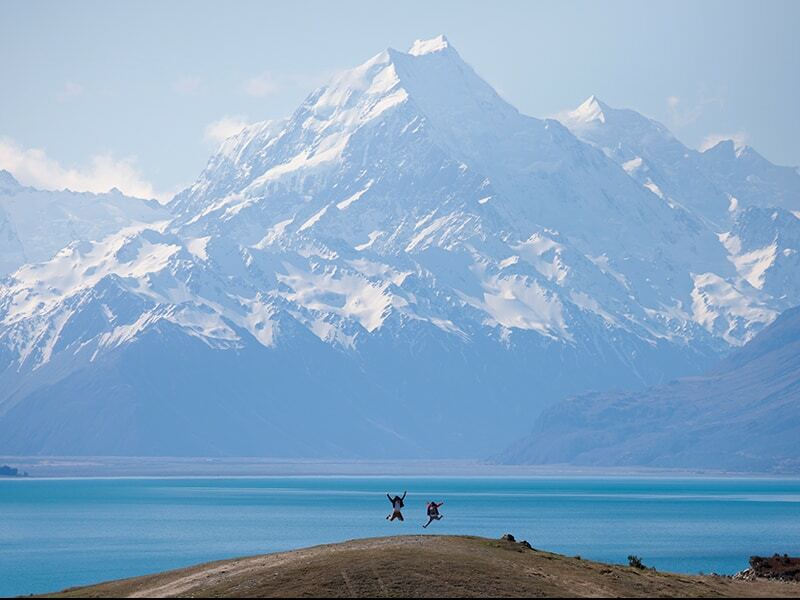 Get outside and do as the Kiwis do; hike, bike and enjoy the great outdoors. If you’re feeling gutsy, get high with a bungee jump or take to the sky and see New Zealand from above. The opportunities are endless as you chauffer yourself to quaint towns, through beautiful mountains and across scenic valleys. On arrival into Auckland, collect your rental vehicle and drive to your accommodation. Auckland, ‘City of Sails’, located between two stunning harbors, enjoys a mild year-round climate Auckland is the country’s most visited region and largest urban area, offering exciting activities and great shopping. Experience Auckland by exploring important historical sites and learning more about the fascinating Maori culture and history along the way. This luxury tour features Auckland’s well known cityscapes with its numerous volcanoes. See Auckland through the eyes of a passionate local guide, who can share their cultural knowledge and upbringing along with special aspects of the Maori culture. Take in magnificent views of several ancient volcanoes including Rangitoto Island in the Hauraki Gulf. At 600 years, it is the largest & youngest of all the volcanoes in Auckland. Explore Auckland Domain, Auckland’s second largest volcano and home of the Auckland Museum & Wintergarden before driving through the boutique suburb of Parnell with its many colonial homes. Travel through Tamaki Drive with sweeping views across the Waitemata Harbour toward Bastion Point & Mission Bay, Auckland city’s most well-known beach, and then ride over the Auckland Harbour Bridge and see the beautiful marine village of Devonport. Commence the leisurely drive to Rotorua. Drive time is around 4 hours, but allow most of the day to take in the sights along the way. You have a couple of options with the road via Waitomo Caves and the Glow Worm Grotto being the most popular (if you want to see the caves), or alternatively take the road via the Coromandel Peninsula for some breathtaking scenery (this will take a little longer as you will want to make quite a few extra stops). New Zealand, or Aotearoa, is a mythical land steeped in legend and mystery. The diverse landscape of Rotorua is where adventure abounds. There are great forest trails for mountain biking or hiking. Take your chance to spy from the sky by helicopter, biplane, or floatplane – and maybe land on a dormant volcano – or an active one! Try tandem skydiving or tumble head over heels down a hillside in the revolutionary Zorb. Safaris through native forest and over rugged farmland on horseback or by farm-bike, jet boating and fishing are other activities that abound in the area. Depart from your Rotorua city accommodation for this small group tour of Rotorua’s most natural and popular geothermal parks – Wai O Tapu and Waimangu Volcanic Valley. The two parks offer a variety of thermal activity. At Wai-o-tapu, the colorful hot springs are the key features along with the famous Lady Know Geyser. At Waimangu Volcanic Valley, the guide will explain the Mt Tarawera eruption which blew open this now spectacular, bush-covered, geothermal park. The local naturalist guide will explain the volcanic processes of Rotorua and New Zealand, while you have the opportunity to view the volcanoes, geysers, New Zealand’s largest boiling mud pool, and hot springs. Next, you will learn about Maori customs, traditions, history and protocols new and old, with a guided visit to Te Puia, Rotorua’s premier cultural center. The guided tour through Te Puia includes a visit to the wood carving school, art and craft gallery , Rotowhio Marae, weaving display, kiwi house and finally Pohutu Geyser. Experience the warmth of the Maori people during an evening of ceremonial rituals, powerful cultural performance, storytelling & hangi feasting. Share in the Powhiri – an ancient ceremony of welcome before you are invited into the Pre-European Maori village nestled within the native Tawa forest. Enter the living village, as it comes alive with the sights, sounds and activity of days gone by, including facial tattooing, weaving, carving and demonstrations on how food was cooked and preserved many years ago. Witness the earth being scraped carefully away from the hangi pit by your selected Chiefs, to reveal baskets laden with your sumptuous feast, which has been cooked beneath the ground on hot stones. The sharing of food is an important part of Maori custom – join in the traditional hangi buffet feast, followed by New Zealand dessert. The evening draws to an end with the Poroporoaki – the official closing ceremony. At your leisure for this 5-6 hour drive through the center of the North Island. The main features of the area are the farmlands, the active volcano area of Tongariro National Park and Lake Taupo and the Ruahine Forest Park. Discover fresh tastes in New Zealand’s café capital, as Zest Tours introduce you to the city, its local tastes, products and people on this popular excursion. Stroll behind the scenes at some favorite Wellington food places with a personal guide, to taste hidden culinary treasures and meet some of the people behind some of the city’s best food. Te Papa Tongarewa means ‘container of treasures’. At Te Papa, you’ll discover the treasures of New Zealand’s land and people, and the stories told with authority and passion. The museum is built on a unique bi-cultural partnership that recognizes and celebrates Maori as tangata whenua – the original people of this land. The 58-mile journey between Wellington and Picton takes just 3 hours and 10 minutes, yet it’s one of the world’s great scenic cruises. When you cruise across on The Interislander, you’ll find a wonderful combination of entertainment and services that will make your Cook Strait crossing even more memorable. At your leisure, drive a short 30 minutes south on State Highway 1 to the beautiful wine district of Blenheim. The distance from Picton to Blenheim is about 18 miles. Today, your tour guide will show you through the fabulous Marlborough wine region stopping to enjoy two fine wine experiences including Marlborough’s Iconic winery, Cloudy Bay. After the winery visits, you will depart the wine region through to the small seaport town of Havelock. Havelock is the gateway to the Pelorus and Kenepuru Sounds, and has the official title of Greenshell Mussel Capital of the World. Enjoy a view of the waterfront , after which we depart Havelock on the Marlborough Travel launch for the Greenshell Mussel Cruise through the Marlborough Sounds. Take in the natural beauty of the native bush and the tranquility of the Sounds. Learn from your experienced Skipper the history of the Marlborough Sounds and the history of the pioneering families who have settled in the Sounds over 6 generations. Visit a Greenshell Mussel farm and learn why this delicacy grows so well in the Marlborough Sounds. Taste a local favorite – freshly steamed Mussels matched perfectly to a complimentary glass of Marlborough Sauvignon Blanc. Allow 4 hours drive time for this 195-mile drive south on State Highway 1. On the way stop at Lake Grassmere Saltworks to see a network of settling ponds that in late summer turn coral pink, and perhaps pause for a cappuccino at Kekerengu. Vantage points along the Highway allow a close-up view of seals basking on the rocks. Explore the garden city and the surrounding areas of Christchurch with a small group of guests in a deluxe mini coach. Departing from your hotel, the tour heads through Christchurch and by the city’s center where you can assess the progress of the rebuild following the 2010/2011 earthquakes. Your driver/guide will discuss the reasons for the event, its impact and the exciting plans for the future. Next, the tour heads towards the Port Hills which overlook Christchurch, and offer stunning views of the city, Canterbury Plains, Lyttleton Harbour and the distant Southern Alps. After dropping into Lyttleton Harbour you will have time explore a private garden which has been growing since 1865 and includes a variety of exotic trees, shrub rhododendrons, camellias and a good variety of New Zealand native plants. Head over the crater rim to another private garden that is 15 years old, the garden has a strong New Zealand theme and a largely formal layout. Within the evergreen structure of totara hedges, there are many native New Zealand plants and hybrids of exotic varieties raised in this country. The tour then heads back towards Christchurch city stopping for a relaxing lunch, then a visit to the Botanical gardens. Here you will see exotic trees that are some of the largest, the tallest or the oldest of their kind in New Zealand. You will see spectacular color, intriguing sculptures, and memorial plantings that celebrate local and international history. If time permits, a stop will be made at another public garden that is rich in history, color and tranquility. The drive today is around 7-8 hours, but there are many interesting diversions along the way as you pass through the Canterbury Plains into the Southern Alps and finally onto Queenstown. Stop at Lake Tekapo and take a scenic flight over Mt. Cook if you have time. An indulgent and varied full-day tour seeing local sights, enjoying fresh cuisine and tasting a selection of fine wines, cheeses and handcrafted chocolates. Taste wines at four vineyards over two Central Otago wine regions. Included is the Gibbston Valley wine cave tour, a splendid cheese and wine presentation and a divine wine barrel-cooked lunch matched with wines. Visit the historic precinct of Cromwell and return to Queenstown via the must-see Arrowtown, with time to take a stroll and sample locally made chocolates at one’s pleasure. At your leisure to explore the adventure capital of New Zealand. Set between the towering Remarkable Ranges and the bottomless Lake Wakitipu, Queenstown has it all – bungee jumping, jet boating, rafting, amazing scenic helicopter flights. You may wish to visit Milford or Doubtful Sound or the old gold mining town of Arrowtown. Explore the surrounding area on your own or on one of our additional day excursions. Today your itinerary with Swain Destinations ends as you drop off your rental vehicle before heading to the airport to return to the USA.